Sometimes truth is stranger than fiction. Regarded as an expert in genetics and law, Lori has written a number of nonfiction books. The New York Times: "...there is still no legal bar to cloning people without their consent or knowledge - say, from hair follicles in their hairdresser's sweepings. Andrews has swallowed this kind of gnat repeatedly with other forms of reproductive technology and can hardly be gagging at it now; the law will never provide paradise on earth, but with help from people of Andrews's quality, it copes." 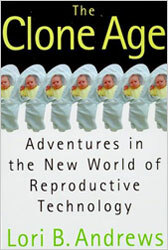 Judicature: "If reproductive technology is the Wild West of medicine... then Andrews herself is surely Paladin, the hero of 'Have Gun, Will Travel.' Whether she is jetting off to Dubai to advise the government on cloning... or brazening her way past the customs agent in Miami, straight off a flight from Columbia with a container of blood samples and sperm that 'absolutely cannot' be opened, Andrews is in the thick of the action. This account of her adventures is a quick read and an enthralling story that should engage and reward the neophyte and sophisticate alike." Available at Amazon.com, Barnes & Noble and Booksense.com. 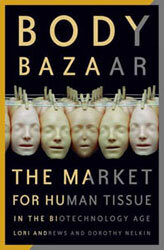 Washington Monthly: "In their highly informative Body Bazaar: The Market for Human Tissue In the Biotechnology Age, Lori Andrews and Dorothy Nelkin… draw on numerous examples of questionable medical ethics to illustrate their contention that biotechnology is spinning out of control."